Desire Bahombwa Asukulu arrived at Chicago’s O’Hare Airport on April 17, 2012, exhausted from the flight and over a decade of turmoil in his home country of The Democratic Republic of the Congo (DRC). With him were his wife, Alphonsine, and their six children. As expected, the family was apprehensive about resettling in their new home; the life that they led before coming to Chicago left them with years of uncertainty. In October of 1996, a brutal conflict was waged in the DRC between ethnic militias and the government. The rebels began coercing men to fight in the vicious civil war. Often, those who didn’t join them were killed. In 1997, Desire – who refused to become a rebel solider – and his wife were forced to flee from their home by foot. They walked toward Tanzania for 3 days, seeking asylum in the neighboring country. Along with them were other townspeople, his elderly mother, brothers and sisters, and his wife’s family. Once they crossed the border, they were welcomed into the Nyarugusu Refugee Camp by UNHCR. Life in the camp was challenging. Many died from illness and inadequate medical care. Provided with limited space, Desire built a small 25ft by 15ft hut, using cut wood they collected themselves. For a year, he and his wife grew idle with little work to do. But his 15 years of education – and his prior occupation at a non-profit organization fundraising for disadvantaged children – would prove useful in the camp. When a secondary school was opened in Nyarugusu, Desire was hired as a teacher, giving lessons on economics and finance. This new position allowed him to supplement the meager food rations they received. Despite the rough conditions, it was in the camp that all six of their children were born. Upon his realization that the situation in the DRC was worsening, in 2002 he met with UNHCR officials to request asylum in another country. It wasn’t until eight years later in 2010 that the eight-member family was told they would be considered for resettlement. Though unsure of what to expect, Desire rejoiced in the good news. They would finally be leaving their misery behind. 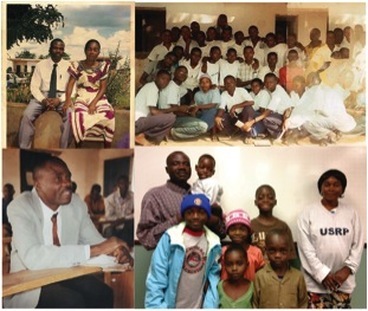 It was only one day before leaving Tanzania that Desire and his family found out they would be going to Chicago. When greeted at the airport by RefugeeOne staff and a co-sponsor group from the Yale University Alumni Club of Chicago, his anxieties began to subside. He was overcome with, of all things, courage. Courage to begin his first job, English and ensure his children have a chance at an excellent education. As the doors to their new apartment swung open, they were taken aback. They were no longer cramped together in the make-shift shelter they had lived in for 15 years, but were surrounded by the warmth indicative of a real home. The house, replete with all the necessities to start over, including clothes, furniture, and toys for the children, was more than they could have asked for. Desire and his family are endlessly grateful for the compassion that was, and continues to be shown by the Yale Alumni Club and RefugeeOne staff. He is eager to begin his calm and conflict-free life. Once they settle in, Desire plans on accepting the first job offered to him. He dreams of continuing his education and providing a good life for his children. When asked if he wants to return home one day, he quickly replies “no,” and states that this is his country now. Desire has just been offered a job and will start working at the end of September 2012. He is completing his English Language Training at RefugeeOne and is enrolled in Computer Courses where he has shown excellent keyboarding skills —25 WPM. Desire is multi-lingual and speaks over 5 different languages. Desire’s children have started school and Alphonsine, Desire’s wife, continues her English Language Training classes. Your financial contribution can assist with the resettlement of families like Desire’s.